When Claudia Jones organised a small cabaret style show called 'Elements of Caribbean Carnival' at St. Pancras Town Hall in 1959, I doubt that she ever imagined that its legacy would still continue fifty-five years later. In 1961 the show was turned in a beauty queen contest as the Lyceum Theatre, and it evolved once more in 1963 into a masquerade. When Claudia Jones passed away, the event was taken over by Rhuane Laslett, who turned it into a carnival in 1966. Since then, the Notting Hill Carnival has been a big annual community event, celebrating multiculturalism and the performing arts. This year's carnival will begin on the 23rd August with a Panorama family open air evening Emslie Horniman Pleasance Park. From 7pm - 11pm, you can watch and listen as national steel bands compete. On Powis Square Calypsonian artists will give an electrifying showcase of storytelling, poetry, political commentary, and humour from 8pm. At 6am on the 24th August, the Jouvert carnival officially opens. Join the dancers in a procession that lasts until 10pm. Jubilant children will parade in flamboyant costumes, dancing along the carnival route to the hypnotic rhythms. 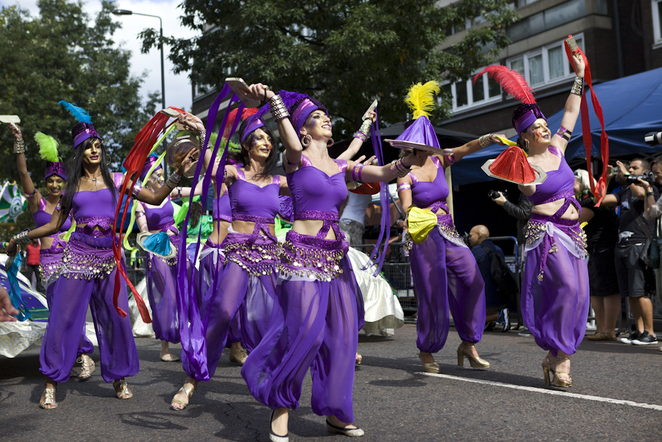 Monday's parade on the 25th August will feature another sixty vibrant bands, creating the ultimate party atmosphere.